IPIECA, the United Nations Development Programme (UNDP) and the International Finance Corporation (IFC) launched a new joint report, Mapping the oil and gas industry to the Sustainable Development Goals: An Atlas, at the SDG Business Forum organized in conjunction with the UN High-Level Political Forum in New York last week. 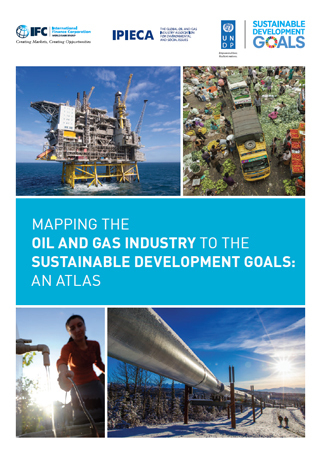 The Atlas explores the links between the oil and gas industry and the Sustainable Development Goals (SDGs) and seeks to facilitate a shared understanding of how the industry can most effectively support the achievement of the SDGs. The oil and gas industry is committed to responsible and sustainable business, as well as serving as an essential partner to meet the challenge of achieving the SDGs. "The SDGs represent an ambitious, collective, international agenda,” said Bernard Sheahan, Global Director of Infrastructure and Natural Resources, IFC. “Achieving the Goals will require partnership and collaboration between and among all sectors and industries. By mapping the linkages between the oil and gas industry and the SDGs, we hope to encourage our clients and partners to further embed the Goals into their business and operations and seek out new, innovative ways to contribute to global development." “The private sector has a critical role to play in the achievement of the SDGs. This Atlas provides practical recommendations and examples of how the oil and gas industry can take action to ensure that the social and economic benefits are widely shared and environmental impacts are minimized,” said Nik Sekhran, Director for Sustainable Development, UNDP. “We look forward to using this report to inform dialogue and collaboration in SDG implementation in oil and gas rich countries”. “We are delighted to launch the Atlas which we believe will be a valuable tool for companies as they work to align with the SDGs framework. The SDGs will be central to how the industry frames and communicates its contribution to sustainable development going forward,” said Brian Sullivan, IPIECA’s Executive Director. The Atlas outlines the typical roles and responsibilities of key stakeholders in enhancing the industry’s contribution to sustainable development. It presents examples of good practice in the industry, alongside existing knowledge and resources on sustainable development that could help the industry make useful contributions to the SDGs. The Atlas presents the SDGs Goal by Goal, focusing on the contribution the oil and gas industry can make to each Goal by integrating it into core business operations and by identifying opportunities for oil and gas companies to collaborate with other stakeholders and leverage experiences and resources in support of the Goal. Each chapter also includes case studies of innovative and sustained efforts by companies, often working collaboratively. IPIECA in partnership with UNDP and IFC have worked together over the past year to prepare the report. The preparation of the report has included wide consultations and inputs from the oil and gas industry, as well as from civil society, academia, and international organizations. IPIECA will attend the United Nations High-level Political Forum (HLPF) in New York from 17-19 July 2017.